The McDonald’s corporation has lately fallen on hard times, enduring seven straight months of declining domestic sales, a food safety scandal involving its Chinese meat supplier, politically motivated restaurant closures in Russia, even a Consumer Reports survey ranking its burgers as the “worst in America.” So on a December 10th conference call, McDonald’s CEO Don Thompson and U.S. President Mike Andres sought to reassure skittish McDonald’s investors by outlining a seven-point plan to turn around the troubled corporation. “have got to be in the schools. When you look at the performance relative to peers of the operators [whose] restaurants are part of the community–it’s significant. So we’re celebrating that…this is an essential part of being an McDonald’s owner operator. This is our heritage. And schools are a big piece of it.” Emphasis mine; you can listen to a complete recording of the call here. But the most troubling aspect of McDonald’s plan is that it flatly contradicts statements made on the corporation’s behalf before the federal government regarding the intent and impact of such in-school marketing. But as McDonald’s U.S. president Andres’s own comments to investors on December 10th make abundantly clear, getting the company’s marketing messages in front of impressionable school kids and their parents is anything but “incidental;” according to the McDonal’s top executives, in-school marketing is actually critical to its bottom line. That statement was, of course, factually inaccurate at the time Thompson made it, and a few months later the company’s spokesperson had to backpedal when the statement became the subject of a letter campaign organized by the Campaign for a Commercial-Free Childhood. It remains to be seen whether the USDA will buy into CFBAI’s laughable notion that McTeacher’s Nights and other forms of in-school fast food marketing (whether implemented by McDonald’s, Dominos Pizza, Chick-Fil-A or any other chain) don’t constitute “advertising” and shouldn’t fall under the proposed Smart Snacks on-campus advertising ban. The comment period on the proposed wellness policy rules ended in April but we don’t yet know when the final rules will be released. 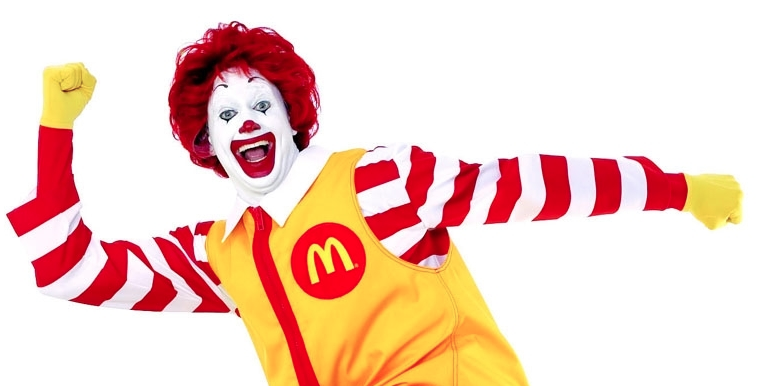 Ronald McDonald is the Joe Camel of fast food and does not belong in schools. Kids ultimately pay the price for a McEducation and rising health costs related to diet-related diseases mean less money for schools. There is a growing backlash against McDonald’s aggressively marketing to children and their sales will continue to slide unless they change course.